To overcome the obstacles that many who are impoverished or marginalized experience, it often takes what seems like superhero powers. Add single parenthood to that and the obstacles can be even more daunting, clouded as they are by the daily demands of caring and providing for children often without relief. "Any parent is a superhero. Everyone is unique and has something to contribute," says Nicole Miller, Office Manager at Urban Alliance. "But I think there's something special about a single parent who wants something more in their life. It's easy to settle. It's easy to say this happened and this is what it is. But there are a lot of single parents who say this isn't how it is. There should be more. There can be more. And I'm capable of more." According to the 2014 U.S. Census, 36 percent of Edison households are single mothers and another 16 percent are single fathers. Together, over half of Edison families are managed by single parents, some of whom moved to the neighborhood following a divorce, enticed by the closeness to downtown and services such as a grocery store and public library, Edison's two magnet elementary schools (Washington Writers' Academy and Edison Environmental Science Academy), a strong Edison Neighborhood Association, and most importantly, affordable housing. Samantha Drew is one such superhero among many who live in Edison, according to Miller. "She's overcome these very bad circumstances, but she's kind of kicking it to the curb. She's saying I'm going for more and I'm going to get it. And she's always looking for ways to give back and help," says Miller. "Not only is she doing it on her home front, she's doing it in her community. That's what it means to see that evolution of what it means to be a superhero to me." A mother of six and foster mother of one, Drew and her husband Jamaal moved from Pullman to Edison nine years ago attracted by the Kalamazoo Promise. 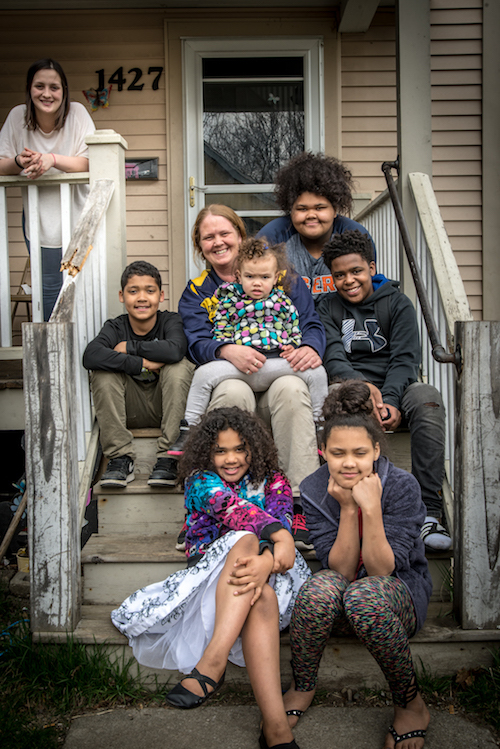 With the assistance from Section 8, a U.S. Department of Housing and Urban Development subsidy program, the Drews rented a home for their then five children and with one on the way, were beginning to get to know their neighbors and children's teachers when tragedy struck. Samantha's husband, Jamaal, was killed in a car accident, and Samantha became part of the legion of single-parent families in Edison, struggling to pay the rent, care for the children and the house, and have enough cash left over to purchase incidentals, like toilet paper. "That was horrible for the first four years," she says. "Struggle, struggle, struggle. I had all those kids in diapers. My baby was born five days after my husband got killed." Many single parents, especially those without nearby family members, are stretched thin trying to care for finances, home, and children. And while support is available, not all know where to seek it. Edison is fortunate to have within the neighborhood over 12 churches and many nonprofits with programs that seek to help the disadvantaged and marginalized live productive, fulfilling lives. Urban Alliance is one such organization. Its mission, through a variety of employment training, housing support, and other outreach, is to "communicate through our actions that we value each individual." "The individuals we're working with are juggling a lot of different variables in their lives as either a mother or a father. They may have very little support," says Miller. "When I started working here three years ago, I had no idea of the disparities that exist in our community, that there are so many that are under-represented and under-served. It really hit me when I started engaging and understanding people's stories. "Then I saw that this is the work I need to be doing because these individuals don't know that they are valued. So if I can be in a place where I can encourage them, that's where I want to be." A few years ago, having exhausted the resources of her then $9 an hour job as a school janitor and having years earlier come to the end of her Section 8 subsidy, Drew was preparing to move her family out of their Edison home when a neighbor suggested Samantha put in a request to Urban Alliance's lease-to-own housing program. Drew calls the moment with her neighbor "a God thing." "From there, it just went up," she says. "As soon as I got in contact with Urban Alliance, they've never turned their back on me." "Sam is someone who has gone through many obstacles in life. Many would be stopped in their tracks," says Miller. "But she decided to make more of her life so she could show, not only herself, but also the people around her, that you are going to go through trials, you are going to have challenges, but you can pick up the pieces and still make it happen." Miller, who in her role at Urban Alliance, manages the Urban Alliance housing program, ensures that Drew's house is in good repair and that she is getting to the point that she can purchase it next year. "Outside of that, my role is as a friend and support system. I'm at their house three or four times a week. For me, she's family. I grew up in Allegan. My parents and my family are there. She is my family here." 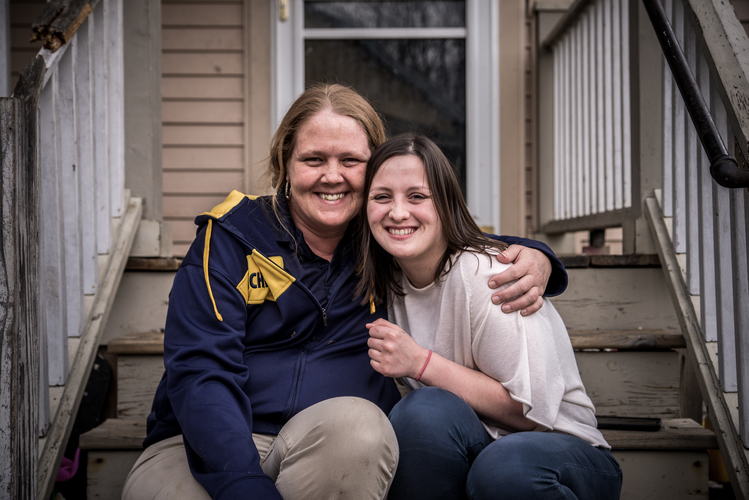 Not only did Drew's house get accepted for the housing program, but Drew said she has discovered a sense of family and community among her neighbors and the Urban Alliance Team. "We're all a big family now. When you're a single parent, you need that," Drew says. Drew now has seven kids and one foster child. Two are grown and already on their own, and four are at home, ages 2 to 16. She is currently fostering a 13-year-old grand nephew whom she plans to adopt. In addition to her roles as mother and provider, she hosts a house church on Tuesdays, which Miller often attends. "Sam has made a choice to empower herself, but she is still there and available to meet people where they're at, people who haven't quite yet made the decision to move forward in their lives," says Miller. "She was there herself." At 39, Drew still has lots of plans for bettering her life. She credits the community at Comstock STEM Academy, where she works, for inspiring her to pursue her education. "I know I don't make a lot of money, but them people taught me so much, how to manage with my kids, and actually care about the kids' school. Before I did care and I didn't care." On a recent birthday, Drew said that the whole school in Comstock walked down to greet her in a line, "like a train, all 200 of them, just to give me a birthday card. "That's another God thing. It keeps me going. I'm blessed. Not many single parents get the options or get the experience to go through what I'm going through. I know it's hard, but I have a lot of support around me. And I'm thankful because some people haven't got it." Now it's her turn to share the support, she said. "A friend out here wants to give up, and I say, 'You can't give up. It's a rough road, but you have to keep going.'" Through the last few years, Drew's life has been transformed, and so, says Miller, has hers. 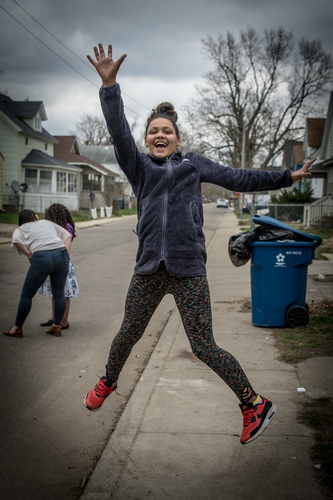 "When I first moved to Kalamazoo, I was told multiple times, don't go to the north side, don't go on the south side, there's crimes, there's drugs. It's really bad," says Miller. "So I lived into that reality. I stayed in my own bubble. "Now I spend all of my time hanging out in the streets. Edison is home for me. It's where I've met so many individuals, like Sam, who I now call family and friends. Whether or not I live in this neighborhood, it's my neighborhood, too." Meanwhile, Drew keeps setting goals, reaching them, and setting new ones. Currently, she is two tests short of earning her General Education Development (G.E.D.) certificate, the equivalent of a high school diploma. When she finishes, she plans to go to school to become a phlebotomist. "I'm trying to move ahead," she says. "I'm telling my children that it's never too late. Theresa Coty O'Neil is a Kalamazoo area freelance writer. Her articles have appeared in many local publications and her short stories have been published in Alaska Quarterly Review and West Branch, among others. She is the Project Editor for On the Ground Edison. Southwest Michigan Second Wave's "On the Ground Edison" series amplifies the voices of Edison Neighborhood residents. Over three months, Second Wave journalists will be embedded in the Edison Neighborhood to explore topics of importance to residents, business owners, and other members of the community. To reach the editor of this series, Theresa Coty-O'Neil, please email her here or contact Second Wave managing editor Kathy Jennings here. The On the Ground program is made possible by funding from the City of Kalamazoo, LISC, the Fetzer Institute, the Irving S. Gilmore Foundation, United Way of the Battle Creek and Kalamazoo Region, Michigan WORKS!, the Kalamazoo Community Foundation and the Arts Council of Greater Kalamazoo. For more Edison coverage, please follow these links.